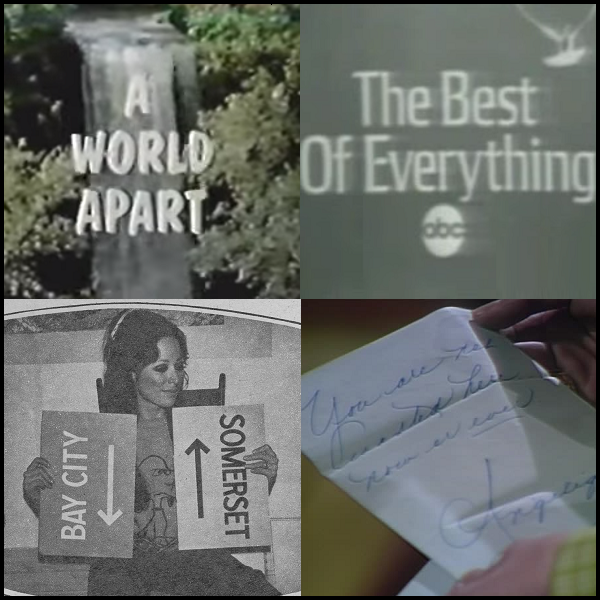 1970: A World Apart and The Best of Everything premiered on ABC. Another World spinoff Somerset premiered on NBC. Dark Shadows' Maggie found a mysterious note. 1970: Daytime soap opera A World Apart premiered on ABC. The show was created by Katherine L. Phillips, Irna Phillips' daughter, and combined Irna's own life story with examples of the generation gap. Susan Sarandon and Matthew Cowles were siblings Patrice and Chris Kahlman, adopted children of soap opera writer Better Kahlman (played by Elizabeth Lawrence and later Augusta Dabney) who had never married. A well-written family drama in the World Turns vein, it also featured Susan Sullivan, James Noble, Kathleen Maguire, Stephen Elliott, Tom Ligon and William Price. Set in Chicago, and taped in New York, its directors included Tom Donovan and Walter Gorman. Donovan also produced. It was cancelled June 25, 1971. 1970: Daytime soap opera The Best of Everything premiered on ABC. James Lipton adapted it from the Rona Jaffe novel about the woes of working girls in New York, set mainly at Key Publishing Company. The main characters were Linda Warren (Patty McCormack), April Morrison (Julie Mannix), Kim Jordan (Katherine Glass) and Barbara Lamont (Rochelle Oliver). They were tormented by their ruthless editor, Amanda Key (Gale Sondergaard), and counseled by the warm and loving Violet Jordan (Geraldine Fitzgerald). The series lasted less than six months, with the finale airing on September 25, 1970. 1970: On Another World, Russ Matthews was upset when the expensive crib his wife, Rachel (Robin Strasser), ordered arrived. She tried to gain sympathy with tears but it didn't work. 1970: Another World: Somerset premiered on NBC. 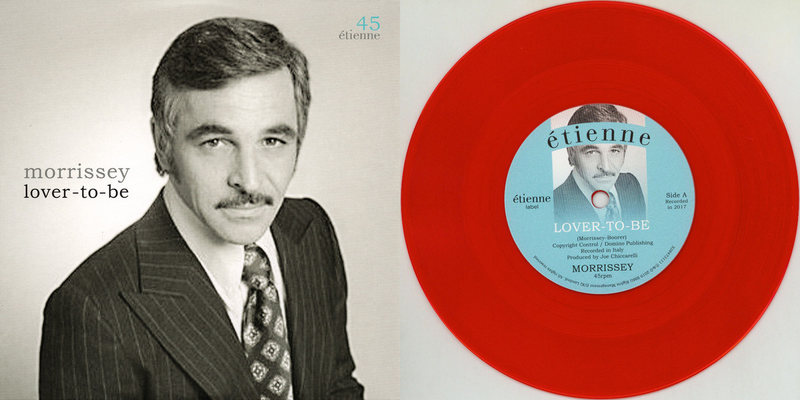 This spin-off featured Another World regulars Jordan Charney (as attorney Sam Lucas), Ann Wedgeworth (Lahoma Lucas) and Carol Roux (Melissa Matthews) whose characters relocated to Somerset, fifty miles away from Bay City. Robert Cenedella was head writer of the two shows at the same time, but in 1971 the new show became simply Somerset and the characters ceased to intervisit between shows. Produced by Lyle B. Hill, its cast over the years included Paul Sparer, Georgann Johnson, Edward Kemmer, Joel Crothers, Gloria Hoye, Michael Lipton and Jobeth Williams. After numerous cast reshufflings, writer changes and drastic storyline upheavals, this account of small-town tragedies ended on December 31, 1976. 1970: On Dark Shadows, Maggie (Kathryn Leigh Scott) noticed that someone has slipped a piece of paper underneath the door at Collinwood, which read, "You are not wanted here, now or never." The letter is signed by Angelique. 1981: President Ronald Reagan was shot as he left the Washington Hilton Hotel after speaking at the AFL-CIO Building Trades Conference. East Coast soap fans remember this happened during As the World Turns, One Life to Live and Another World. 1984: On General Hospital, Holly Sutton (Emma Samms) attended the Avalon spa opening. Meanwhile, Blackie Parrish (John Stamos) sat in a jail cell after being arrested for stealing a song. 1987: Another World debuted the "Another World (You Take Me Away To)" song in the opening and end credits. Crystal Gayle and Gary Morris sang the song on the previous Friday's episode, after she survived the Sin Stalker. The clip below features the opening and closing from the July 21, 1987. 1992: On All My Children, Derek Frye (William Christian) and Mimi Reed (Shari Headley) reviewed the possible suspects in the murder of Will Cortlandt case. 1997: British soap opera Family Affairs premiered. 2001: On As the World Turns, Carly Tenney (Maura West) had it out with Julia Lindsey (Annie Parisse) at the mental hospital. 2001: On Guiding Light, Edmund Winslow (David Andrew Macdonald) declared himself the leader of San Cristobel after revealing that election fraud was happening. 2004: On All My Children, Bianca Montgomery (Eden Riegel), heartbroken over Miranda's "death", lashed out at Erica over her previous comments over Bianca's pregnancy. 2006: Legendary General Hospital producer Gloria Monty died at age 84. Before taking over GH, Monty was a director for Bright Promise, The Secret Storm and The First Hundred Years. Read more about Monty here, here and here.